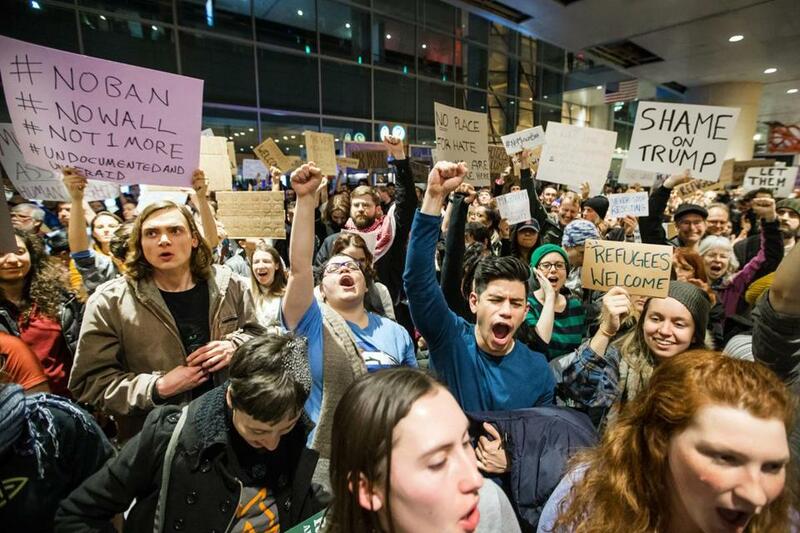 Demonstrators at Logan Airport protested against the ban Tuesday. In a swift decision, a federal judge refused Friday to extend a restraining order that had halted the implementation of President Trump’s controversial immigration ban in Massachusetts. “Because plaintiffs have not demonstrated that they are likely to succeed on the merits of any of their claims, an extension of the restraining order at the present time is not warranted,” the judge said. The ACLU and immigration lawyers had argued that the president’s ban discriminates against Muslims, and they sought a restraining order preventing the government from detaining or deporting immigrants with lawful documentation who were trying to enter the country. The lawsuit listed lawful permanent residents as well as immigrants with visas. And while Gorton agreed that immigrants who are in the country with visas are entitled to some form of equal protection, that standard is lower for immigrants who are trying to enter the country. “There is a distinction … between the constitutional rights enjoyed by aliens who have entered the United States and those who are outside of it,” he said. What remains unclear is whether the administration is revoking visas for people who were legally in the country at the time the order was issued. State Department officials said the executive order would not affect the visas of people already in the country. When asked by the judge if visas would be revoked for non-citizens who were in the US when the executive order was issued, a government lawyer said at Friday’s hearing that the visas would be revoked. The ACLU had also argued that the ban violates the rights of organizations that seek to bring people into the country, such as Oxfam, a Boston-based humanitarian aid entity that brings employees and associates here to testify about conditions in other countries, including five of those countries on the president’s list. But Gorton rejected that claim. While the US Supreme Court has found that the denial of a visa to a non-citizen could potentially violate a US citizen’s First Amendment right to “receive information,” the government could still deny a visa for a legitimate reason. Gorton found that Trump’s claim that the ban was to “protect against terrorist attacks” – and the president’s broad authority to make that claim – constitutes a legitimate reason to deny the visas. “Such a justification is facially legitimate and bona fide and therefore Oxfam’s First Amendment rights are not implicated,” the judge said. John R. Ellement of the Globe Staff contributed to this report. Maria Sacchetti can be reached at msacchetti@globe.com. Follow her on Twitter @mariasacchettiMilton J. Valencia can be reached at milton.valencia@globe.com. Follow him on Twitter @miltonvalencia. As home values throughout the Greater Boston suburbs continue to climb, property owners are being hit with higher tax bills. Hats, gloves, scarves, and puffy jackets came out Friday as New England Patriots fans walked around in T-shirts and shorts. International students and professors who had been denied entry were met by a crowd of well-wishers after making it through customs. Twenty-six years later, classmates still describe President Trump’s Supreme Court as more congenial than confrontational. Relatives of Gary Lee Sampson’s victims spoke about their loved ones at Friday’s hearing. Judge Nathaniel Gorton can seem as stern as they come from the bench, showing little emotion and no appetite for theatrics in his courtroom. Ms. Pomsel, one of the last surviving members of the Nazi hierarchy’s most intimate staff, spent all but the final years of her life in obscurity. The state Legislature quickly overrode Governor Baker’s veto of an $18 million pay package that provides huge salary increases to lawmakers and other officials. Massachusetts businesses, non-profits, universities and hospitals, Governor Charlie Baker wrote in a letter to Trump’s new secretary of homeland security. Mr. Darwall taught for many years at the Cambridge School of Weston before turning to weaving full time.